Along the coastal area between Lēʻahi (Diamond Head) and Kūpikipikiʻō (Black Point) several small neighborhoods are sometimes identified by the names of the main roads in the area Kaikoo, Papu Circle and Kulamanu. However, the historic name for this area of Oʻahu’s is Kaʻalāwai. Kaʻalāwai literally means ‘the water (basalt) rock’ and is probably named for the springs on the beach and among the rocks at the east end of the beach. It is a narrow, white-sand beach with a shallow reef offshore, which generally has poor swimming conditions. There are only a few scattered pockets of sand on the nearshore ocean bottom. Lots go surfing outside. In the late-1930s, Doris Duke built her Honolulu home, Shangri La, on five acres overlooking the Pacific Ocean and Diamond Head. Shangri La incorporates architectural features from the Islamic world and houses Duke’s extensive collection of Islamic art, which she assembled for nearly 60 years. Through an Exchange Deed dated December 8, 1938 between the Territorial Land Board of Hawai‘i and Ms Duke, two underwater parcels (totaling approximately 0.6-acres) were added to the Duke property. At water’s edge below the estate, Duke then dynamited a small-boat harbor and a seventy-five-foot salt-water swimming pool into the rock. The harbor was built to protect Duke’s fleet of yachts, including Kailani Lahilahi, an ocean-going, 58-foot motor yacht and Kimo, the 26-foot mahogany runabout that Duke sometimes used to commute into Honolulu. Another stretch of beach here had some other interesting ownership/use issues. 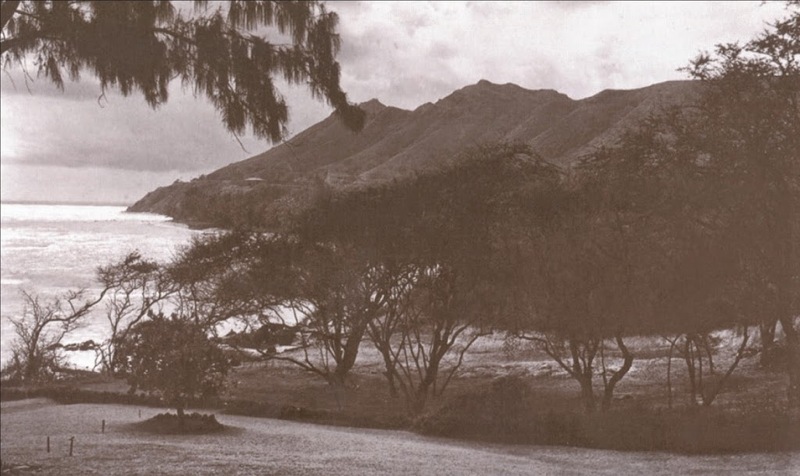 In the old days, a Beach Road ran right next to the water at Kaʻalāwai. When some of the private property mauka of the road was subdivided into seven lots and conveyed in 1885, the makai boundaries of these seven lots were specified “along the road”. However, in 1959, folks adjoining the then-abandoned road soon made claims to it – most extended their landscaping (and even put in improvements (patio, walls, etc)) out over the old beach road. Some of the abutting owners succeeded in their title claims and subsequent legal battles, obtaining declaratory judgments in their favor and they gained title to the road remnant real estate. Subsequently, the Hawaiʻi Supreme Court ruled that the State owns the road. The last property made application to the State to acquire the road remnant, however, after following discussions, they ended up seeking a long-term easement over the old roadway. Oh, one more Kaʻalāwai story … following the overthrow of Queen Liliʻuokalani in 1893, the Committee of Safety established the Provisional Government of Hawaiʻi as a temporary government until an assumed annexation by the United States. The Provisional Government convened a constitutional convention and established the Republic of Hawaiʻi on July 4, 1894. The Republic continued to govern the Islands. From January 6 to January 9, 1895, in a “Counter-Revolution,” patriots of the Kingdom of Hawaiʻi and the forces that had overthrown the constitutional Hawaiian monarchy were engaged in a war that consisted of battles on the island of Oʻahu. It has been called the Second Wilcox Rebellion of 1895 (named after Robert William Wilcox.) In their attempt to return Queen Liliʻuokalani to the throne, it was the last major military operation by royalists who opposed the overthrow of the Kingdom of Hawaiʻi. Wilcox’s headquarters was at Kaʻalāwai. (Daily Bulletin, January 19, 1895) Shortly after the fighting began, losing the element of surprise and seeing no tactical importance in remaining at Diamond Head, Wilcox ordered his men to retreat to Waiʻalae. Wilcox and his men then escaped to the Koʻolau up a trail on the precipice to the ridge separating Mānoa from Nuʻuanu. On that ridge his men dispersed into the mountain above; Wilcox and a few others crossed Nuʻuanu that night, eluding the guards. They were later captured. Queen Liliʻuokalani was put under arrest on the 16th, and confined in a chamber of ʻIolani Palace. A tribunal was formed and evidence began to be taken on the 18th. Nowlein, Wilcox, Bertelmann and TB Walker all pleaded guilty, and subsequently gave evidence for the prosecution. Convicted of having knowledge of a royalist plot, Liliʻuokalani was fined $5,000 and sentenced to five-years in prison at hard labor. The sentence was commuted to imprisonment in an upstairs bedroom of ʻIolani Palace. She spent 8 months in this room. After her release from ʻIolani Palace, the Queen remained under house arrest for five months at her private home, Washington Place. For another eight months she was forbidden to leave Oʻahu before all restrictions were lifted. Liliʻuokalani died of a stroke on November 11, 1917 in Honolulu at the age of 79. The image shows Kaʻalāwai and Black Point area prior to development. In addition, I have added others similar images in a folder of like name in the Photos section on my Facebook and Google+ pages.